Figure 1. RECQL4 is a MAP with a spindle function. (A) Human RECQL4 binds to microtubules (MTs) in a RanGTP-regulated manner. HeLa nuclear extract (1 mg/ml) was incubated with 2 μM pure taxol-stabilized MTs, in the presence or absence of recombinant importin α/β complex and RanGTP, and pelleted. MAPs were eluted with high salt from the pellet, and the supernatant after a second centrifugation was analyzed by immunoblot. (B) RECQL4 directly binds to MTs. 0.1 μM recombinant RECQL4 was incubated in the absence or presence of 2 μM taxol-stabilized MTs. Samples were separated by centrifugation and the supernatant (s) and pellet (p) fractions were analyzed by Coomassie staining and Western blot (WB) against His6-tag. (C) HeLa cells, stably expressing mCherry-H2B and EGFP-α-tubulin, were imaged for 48 h starting at 24 h post-transfection in intervals of 3 min. A representative track through mitosis is shown from control transfected and RECQL4–down-regulated cells. White arrows show misaligned chromosomes. (D) Quantification of chromosome misalignment in metaphase. Persistent misaligned chromosomes, as shown in (C), were quantitated in more than 100 cell tracks per siRNA in each of the three independent experiments. Error bars: SD. **P < 0.01; *P < 0.05 (t test, two-tailed). 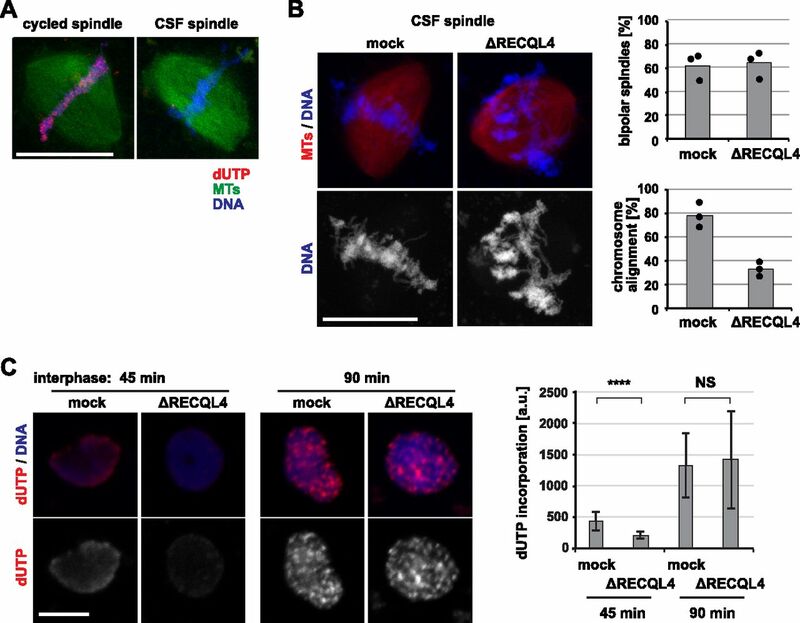 (E) RECQL4 down-regulation slows down mitotic progression. Timing from prophase (0 min) to anaphase onset based on chromatin morphology is shown for the cells treated with control and three different RECQL4 siRNAs. Using data from more than 100 mitotic cell tracks per experiment, three independent experiments are plotted. Error bars: SD. (F) Representative immunofluorescence images from HeLa cells transfected for 72 h with RECQL4 siRNA showing asymmetric monopolar spindles, or control siRNA showing symmetric monopolar spindles. Cells were incubated with 70 μM of the kinesin-5/Eg5 inhibitor monastrol, fixed, and stained with DAPI (blue) and antibodies against α-tubulin (green) and human centromere (CREST, magenta). Scale bar 5 μm. (G) Quantitation shows the percentage of asymmetric monopolar spindles after monastrol treatment in the absence (four independent experiments) or presence of taxol (two independent experiments). More than 22 cells with monopolar spindles were evaluated per data points. Black dots and grey squares indicate the mean of each independent experiment. *P < 0.05 (t test, two-tailed). RECQL4 is a RanGTP dependent MAP. (A) Endogenous human RECQL4 binds to microtubules (MTs) in a salt-sensitive manner. HeLa nuclear extract was incubated in the presence or absence of taxol-stabilized MTs and 0.5 M NaCl and centrifuged. MT pellets were immunoblotted using human RECQL4 and α-tubulin antibodies. (B) Preparation of human RECQL4 antibody. Recombinant human RECQL4 aa 1–831 was expressed in bacteria, purified, and used for antibody production in rabbits. 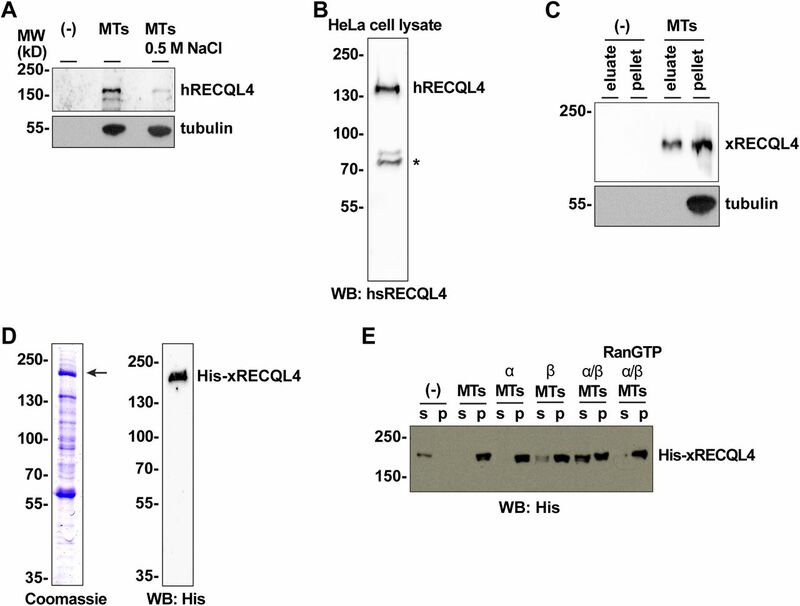 The generated antibody detected endogenous hRECQL4 in HeLa cell lysate. *, nonspecific band. (C) Endogenous Xenopus RECQL4 binds to MTs. Xenopus CSF egg extract was incubated with taxol-stabilized MTs. MTs and MAPs were spun down. MAPs are eluted from MTs with high salt and separated by centrifugation. The eluate and MT pellet were immunoblotted. (D) Recombinant Xenopus RECQL4 expressed in insect cells and purified with TALON beads. Coomassie staining and Western blot (WB) using an anti-His 6-antibody are shown. (E) Xenopus RECQL4 binds to MTs in a RanGTP-regulated manner. Recombinant RECQL4 was incubated with MTs as in Fig 1B, but, where indicated, in the presence of recombinant importin α, importin β, and/or RanQ69L mutant loaded with GTP (RanGTP). After centrifugation, supernatant (s) and pellet (p) were analyzed by Western blot. Downregulation of RECQL4 in HeLa cells. 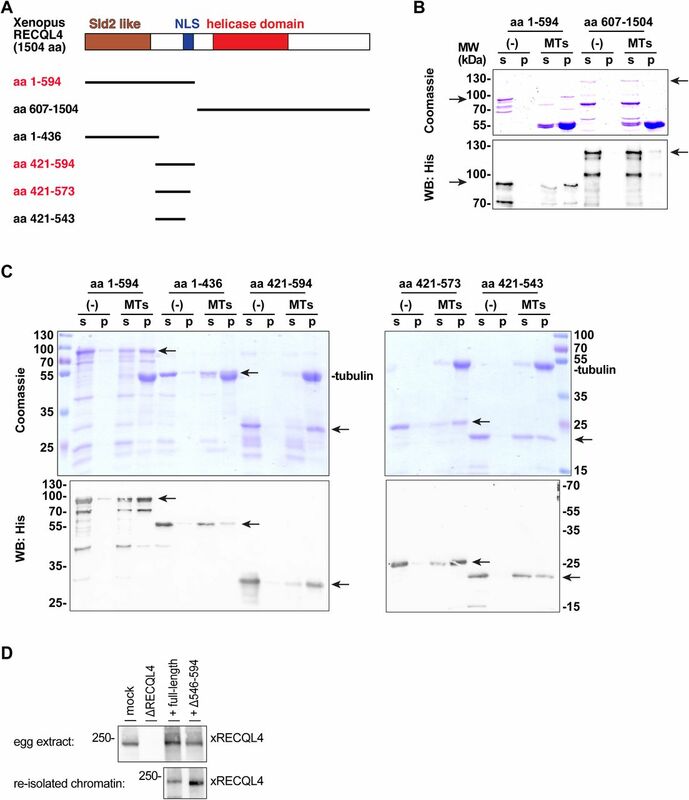 (A) HeLa cells stably expressing histone H2B-mCherry and EGFP-α-tubulin were transfected with siRNA oligonucleotides used in Fig 1. Western blot using human RECQL4 antibody shows the depletion efficiency of the siRNA oligos 48 h and 72 h after transfection. (B) The spindle length in metaphase is similar in Rothmund–Thomson syndrome fibroblasts (AG05013, AG18371) and healthy fibroblasts (GM00323, GM01864). The spindle pole to pole distance was quantified based on γ-tubulin signals (see Fig 2B). Figure 2. Fibroblasts from Rothmund–Thomson syndrome patients have abnormal spindle axis and more micronuclei. (A) Expression of RECQL4 in HeLa, HEK293T, and U2OS immortalized cell lines is compared with the expression in healthy (GM00323, GM01864) and Rothmund–Thomson syndrome patient (AG05013, AG18371) fibroblasts, using human RECQL4 antibody. (B) Rothmund–Thomson syndrome fibroblasts (AG05013, AG18371) show increased amount of micronuclei as compared with healthy fibroblasts (GM00323, GM01864). More than 1,000 interphase cells per cell line were analyzed for the presence of micronuclei (DAPI stained dots) in the cytoplasm, which was identified by the α-tubulin staining. The pictures show a Rothmund–Thomson syndrome fibroblast (AG05013) with a micronucleus (arrow). Scale bars: 5 μm. (C) Fibroblasts were stained with α-tubulin (green) and γ-tubulin (magenta) antibodies and chromatin with DAPI (blue). The tilting of the spindle axis with respect to the culture plate was quantitated based on γ-tubulin staining (centrosomes) as in the scheme. The pictures show examples of spindle axis lateral views from a healthy (GM00323) or Rothmund–Thomson syndrome (AG18371) fibroblast. The plot shows the angle of the mitotic spindle axis with respect to the culture plate. The difference between the two control fibroblast cell lines GM00323 and GM01864 and one patient cell line (AG05013) has P values of 0.02 and 0.01, respectively, the P values of the control and the second patient cell line (AG18371) are 0.06 each. Scale bars: 1.5 μm. Figure 3. 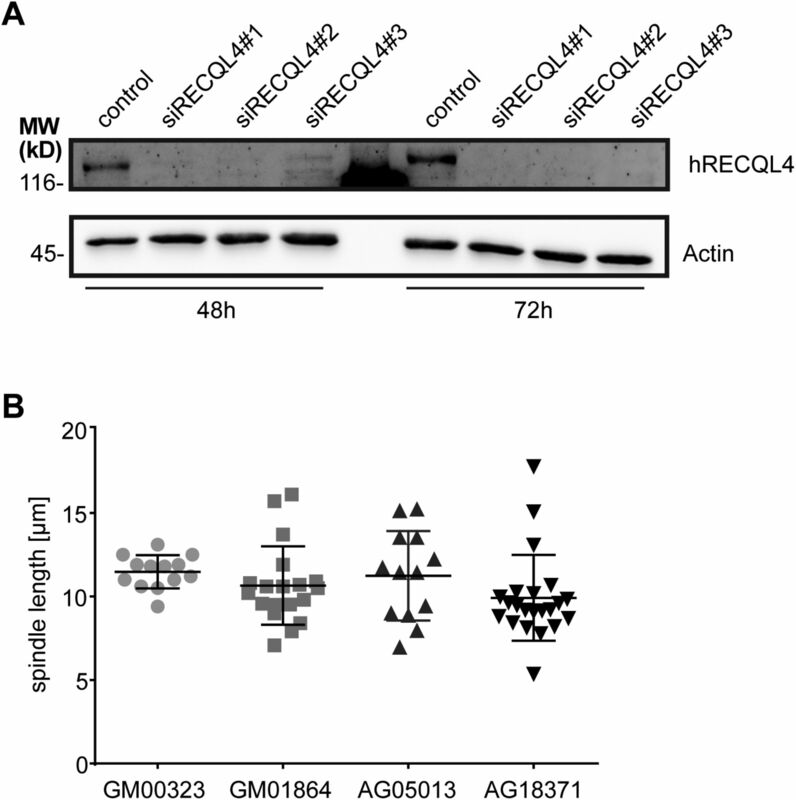 RECQL4 is not necessary for spindle assembly but required for chromosome alignment. (A) RECQL4 binds to chromatin in interphase but not in mitosis. Sperm chromatin was incubated with Cytostatic factor–arrested M-phase Xenopus egg extract (CSF) or interphase extract prepared from the CSF extract by addition of 0.4 mM CaCl2. At indicated time points, chromatin was isolated by centrifugation and immunoblotted for indicated proteins. Histone H2B serves as an indicator of chromatin recovery. 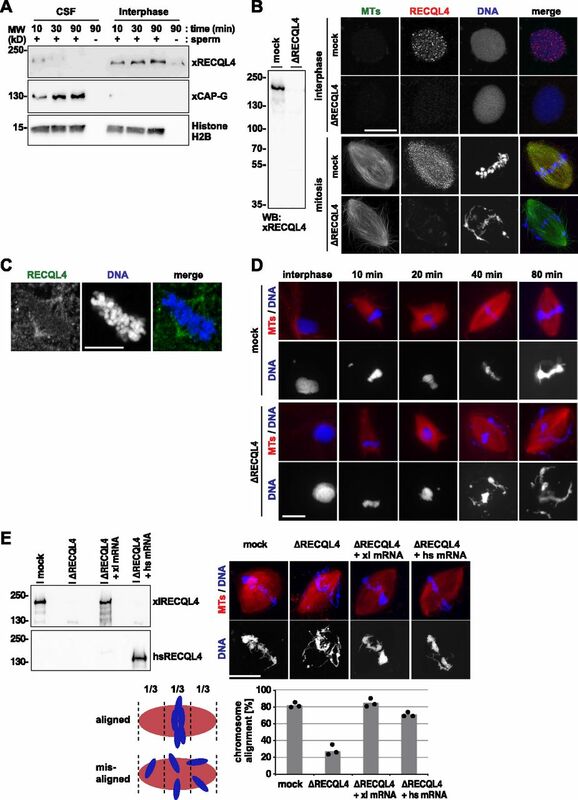 (B) RECQL4 localizes in the nucleus during interphase and on spindle microtubules (MTs) during mitosis. CSF extracts were immunodepleted with control beads (mock) or RECQL4 antibody–coated beads (ΔRECQL4) and depletion efficiency was checked by Western blotting (left). These extracts were incubated with 0.4 mM CaCl2, Alexa 488-labled tubulin (green in overlay) and sperm chromatin to allow nuclear assembly. For observing spindle assembly, the extracts were supplemented with mock or depleted CSF extract. Cy3-labeled Xenopus RECQL4 antibody (red in overlay) was added to the reactions 10 min before fixation. DNA was stained with DAPI. Scale bar, 20 μm. (C) Human IMR-90 fibroblasts were pre-extracted, fixed, and stained with an antibody against human RECQL4. DNA was counterstained with DAPI. Scale bar, 10 μm. (D) RECQL4 depletion causes chromosome misalignment only after spindle assembly is completed. Sperm was incubated in interphase extract supplemented with Cy3-labled tubulin and cycled back to mitosis by adding fresh CSF extract. At each time point, aliquots were fixed, stained with DAPI, and analyzed by microscopy. Scale bar, 20 μm. 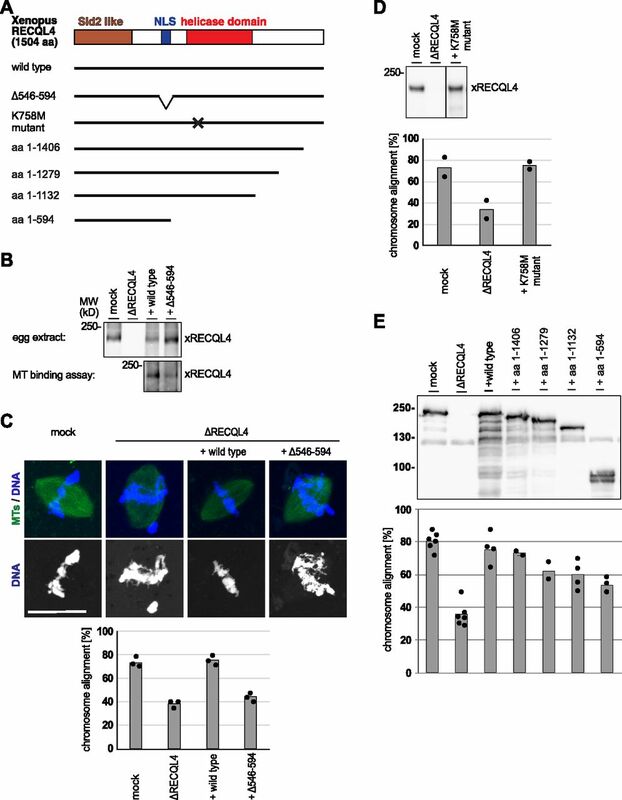 (E) Depletion of RECQL4 from extract and add-back of Xenopus (xl) or human (hs) RECQL4 using mRNAs. The depleted CSF extract was pre-incubated with mRNAs for 30 min, subsequently supplemented with sperm, Cy3-labled tubulin, and 0.4 mM CaCl2, and incubated for another 90 min. The interphase extract was cycled back to mitosis by addition of CSF extract for 80 min. Samples were fixed, stained with DAPI, and analyzed by confocal microscopy. Chromosome alignment was quantified taking into account all bipolar spindle structures. Proper chromosome alignment was defined as all chromosomes located within the central third of the spindle. Columns show the average of three independent experiments and circles indicate individual data points. Extracts at the end of the assay were analyzed by Western blotting with Xenopus or human antibodies. Scale bar, 20 μm. Inhibition of DNA replication and induction of DNA damage does not cause chromosome misalignment. (A) Spindles were assembled by incubation of sperm chromatin in CSF extracts in the presence of Alexa 488-labled tubulin (green in overlay). Cy3-labeled Xenopus RECQL4 antibody (red in overlay) and, where indicated, 6 μg/ml nocodazole to depolymerize microtubules was added to the reactions 10 min before fixation. DNA was stained with DAPI. (B) RECQL4 localizes on Ran-induced spindle-like microtubule (MT) structures. Mock or RECQL4-depleted CSF extract was incubated with RanQ69L-GTP and Alexa 488-labled tubulin. Cy3-labeled Xenopus RECQL4 antibody was added and incubated for 10 min. Samples were then fixed. Scale bar, 10 μm. (C) Inhibition of DNA replication by aphidicolin. 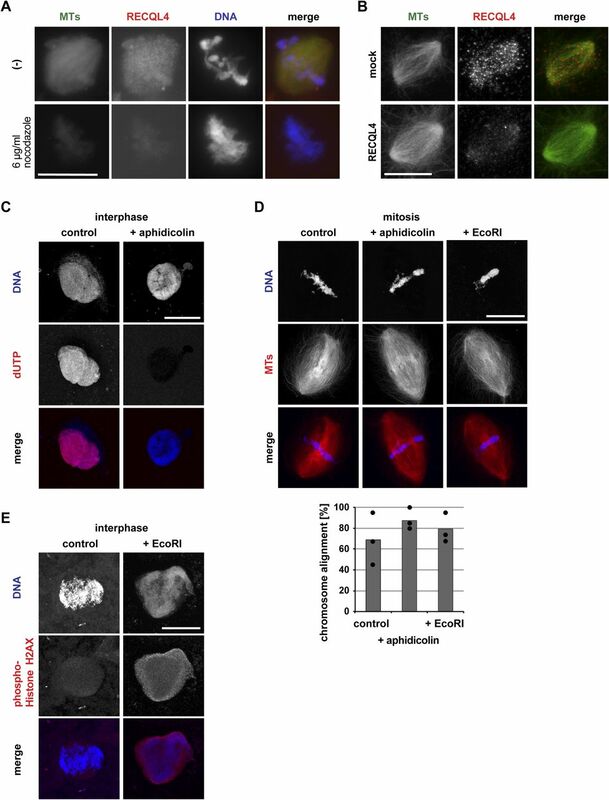 Nuclei were assembled in interphase extract supplemented with Cy3-labeled dUTP in the presence or absence of aphidicolin. Scale bar, 20 μm. (D) Bipolar spindles were assembled in the cycled extracts containing Cy3-labled tubulin in the presence or absence of aphidicolin or EcoRI that induces DNA damage. Chromosome alignment was quantified taking all bipolar spindles into account as in Fig 3E. Columns show the average of three independent experiments and circles indicate individual data points. Scale bar, 20 μm. (E) Sperm chromatin was incubated in the interphase extract in the absence or presence of EcoRI. Samples were fixed, spun down on coverslips, and stained for a DNA damage marker, phospho-Histone H2AX. Scale bar, 20 μm. Figure 4. Mitotic chromosome misalignment is independent of DNA replication. (A) DNA is replicated in cycled but not CSF extracts. To assemble cycled spindles, sperm was incubated in interphase extract and cycled to mitosis in the presence of Cy3-labeled dUTP. To assemble CSF spindles, sperm was incubated in CSF extract in the presence of Cy3-labeled dUTP. (B) Chromosome misalignment in RECQL4-depleted CSF extracts. To assemble CSF spindles, sperm was incubated in CSF extract in the presence of Cy3-labeled tubulin. Samples were fixed, stained with DAPI, and analyzed by confocal microscopy. The frequency of bipolar spindles was counted taking all chromatin structures into account. Chromosome alignment was quantified analyzing all bipolar spindle structures identified. Columns show the average of three independent experiments and circles indicate individual data points. (C) RECQL4 depletion delays but does not prevent DNA replication. Sperm was incubated in interphase extract in the presence of Cy3-labeled dUTP. Samples were fixed at 45 and 90 min, stained with DAPI, and analyzed by confocal microscopy. dUTP intensity on chromatin was quantified using image J. Error bars represent SD. n > 20 structures, N = 2 experiments. ****P < 0.0001; NS (not significant) P > 0.05 (t test, two-tailed). Scale bars, 20 μm. Figure 5. 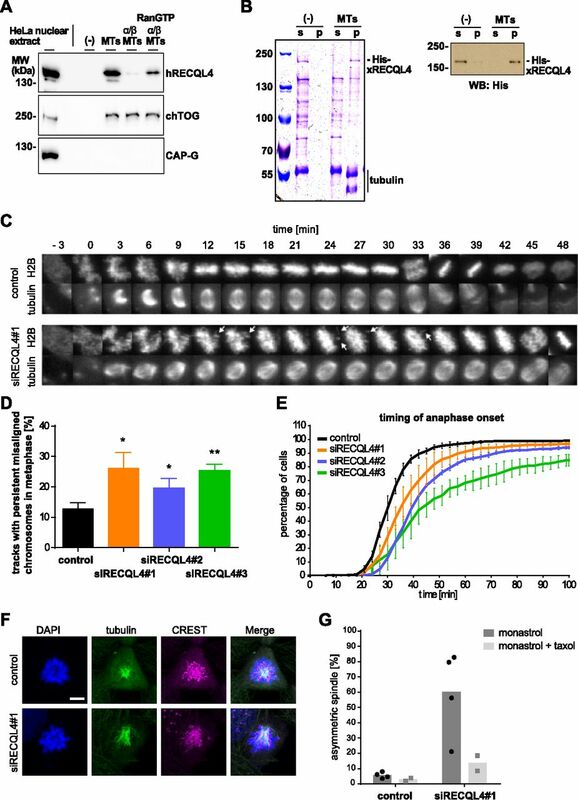 RECQL4 is required for microtubule stability. 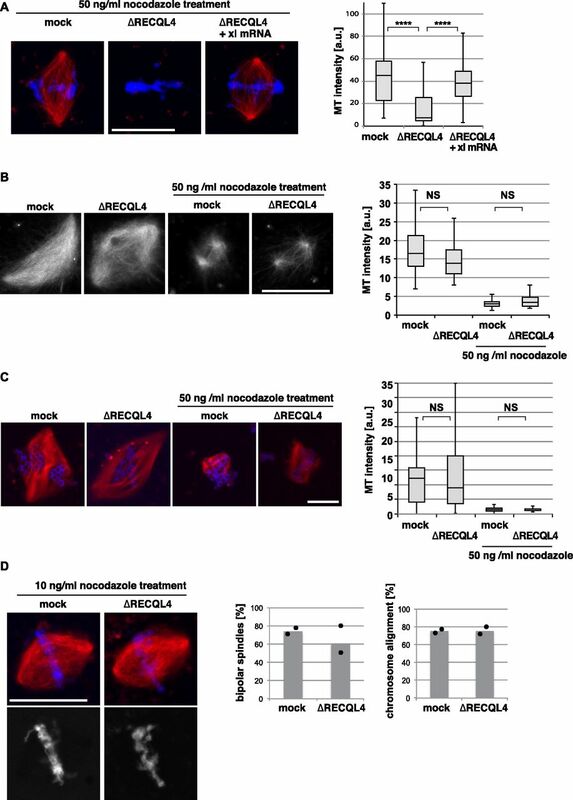 (A) RECQL4 is required for microtubule (MT) stability. Cycled spindles were assembled as in Fig 3C and D and treated with 50 ng/ml nocodazole for additional 10 min. Samples were fixed, stained with DAPI, and analyzed by confocal microscopy. MT intensity was quantified from two independent experiments with more than 30 chromatin structures per condition. ****P < 0.0001 (t test, two-tailed). (B) RanGTP-induced spindles were assembled in CSF extracts and treated with or without 50 ng/ml nocodazole for an additional 10 min. Samples were fixed and analyzed. MT intensity was quantified on more than 20 spindle-like structures per condition. NS (not significant) P > 0.05 (t test, two-tailed). (C) DNA-bead spindles were assembled in cycled extracts and incubated with or without 50 ng/ml nocodazole for an additional 10 min. Samples were fixed, stained with DAPI, and analyzed by confocal microscopy. MT intensity was quantified on more than 30 DNA bead clusters, each containing 15–40 beads. NS (not significant) P > 0.05 (t test, two-tailed). (D) Low concentrations of nocodazole rescue the chromosome misalignment observed upon RECQL4 depletion. Cycled spindles were assembled and subsequently treated with 10 ng/ml nocodazole for additional 10 min. Samples were fixed and analyzed by confocal microscopy. Frequency of bipolar spindles was counted taking all chromatin structures into account. Chromosome alignment was quantified analyzing all bipolar spindle structures identified. Columns show the average of two independent experiments and circles indicate individual data points. Scale bars, 20 μm. 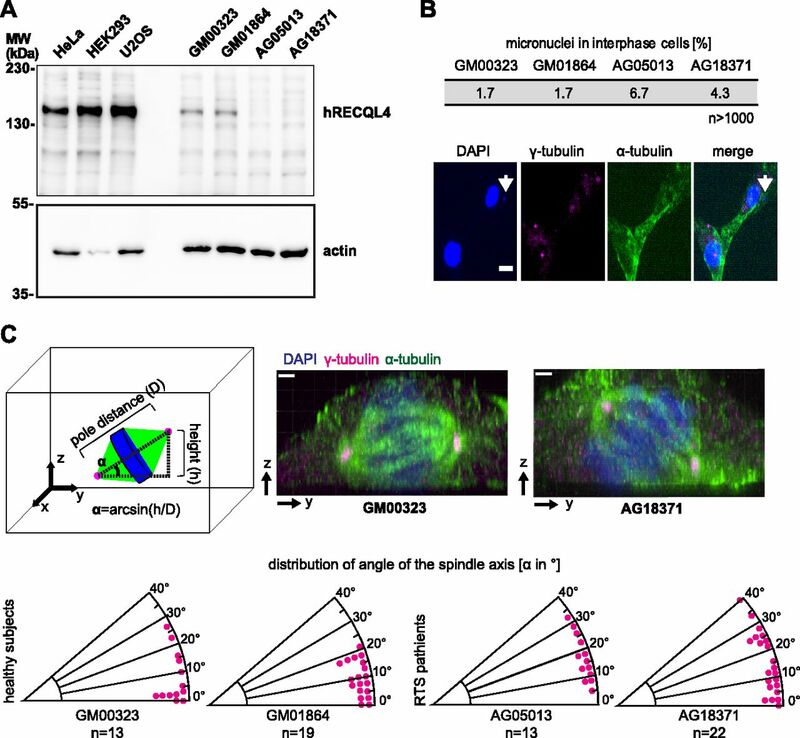 RECQL4 is not required for spindle microtubule assembly. (A) Ran-induced microtubule (MT) assembly in CSF extract. Mock or RECQL4-depleted CSF extract was incubated with RanQ69L-GTP in the presence of Cy3-labled tubulin. After spindle assembly, samples were fixed, spun down on coverslips, and analyzed by confocal microscopy. The number of MT structures was counted in 100 randomly selected fields with a 63× objective. Columns show the average of four independent experiments and circles indicate individual data points. Scale bar, 10 μm. 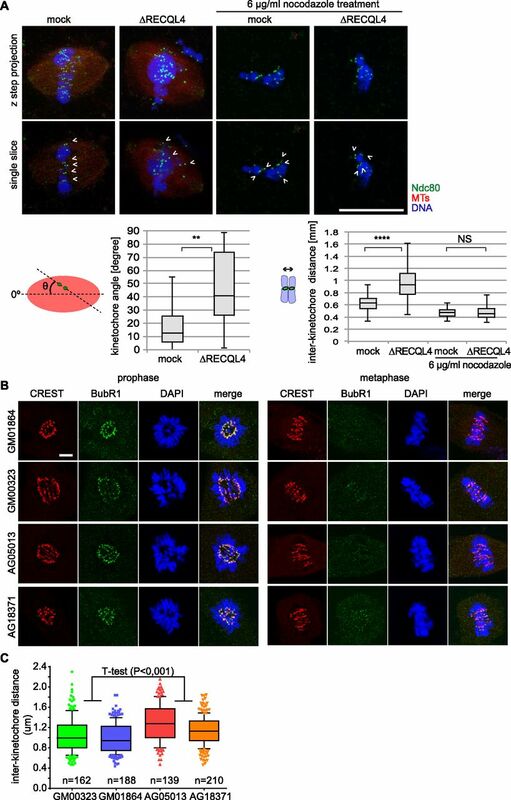 (B) Centrosomal asters were assembled in mock or RECQL4-depleted CSF extract in the presence of Cy3-labled tubulin and purified centrosomes in the presence or absence of RanQ69L-GTP. Samples were fixed, spun down on coverslips, and analyzed by confocal microscopy. MT intensity was quantified. n > 20 structures. NS (not significant) P > 0.05 (t test, two-tailed). (C) DNA-bead spindles were assembled around DNA-coated beads in cycled extract supplemented with Cy3-labled tubulin. After assembly, samples were fixed, stained with DAPI, and analyzed by confocal microscopy. Frequency of bipolar spindles was determined on more than 50 DNA bead clusters, containing 15–40 beads, per experiment and condition. Columns show the average of three independent experiments and circles indicate individual data points. Scale bars, 20 μm. Figure 6. 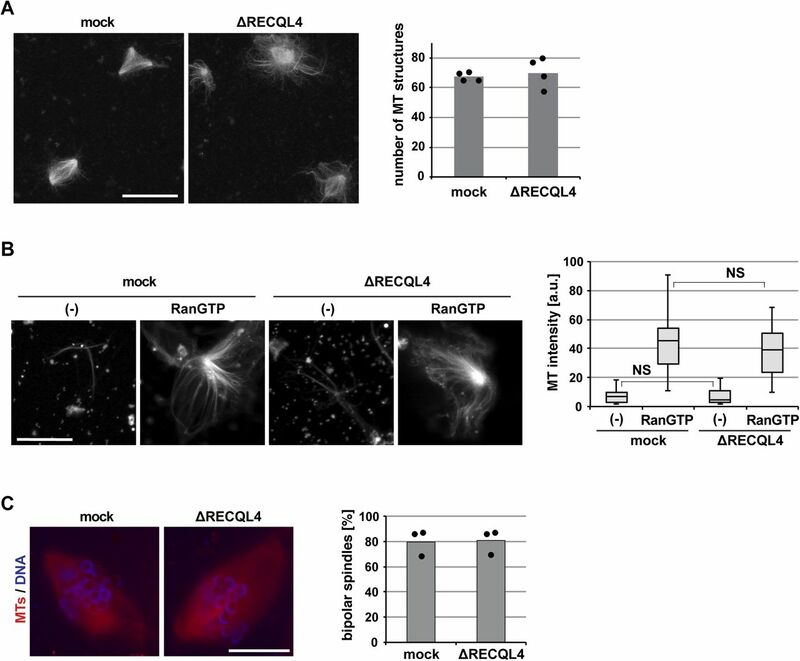 RECQL4 depletion or malfunction increases inter-kinetochore distance. (A) Cycled spindles are assembled as in Fig 3C and D and incubated for an additional 10 min with or without 6 μg/ml nocodazole. Samples were fixed, spun down on coverslips, stained for a kinetochore marker Ndc80 and DAPI, and analyzed by confocal microscopy. Maximum intensity projections are shown in the upper row. Single confocal slices (lower row) were used to detect kinetochore pairs (arrow heads) for further analysis. Quantitation shows the inter-kinetochore distance (right) and the relative angles of sister kinetochore pairs (left), measured with respect to the spindle pole to pole axis. n > 30 kinetochore pairs from > 6 structures. Note that after RECQL4 depletion, sister kinetochore pairs do not align to the pole to pole axis. Scale bar, 20 μm. ****P < 0.0001; **P < 0.01; NS (not significant) P > 0.05 (t test, two-tailed). (B) Immunofluorescence staining of control (GM00323, GM01864) and Rothmund–Thomson syndrome patient (AG05013, AG18371) fibroblasts with the kinetochore marker CREST and checkpoint marker BubR1. Scale bar, 5 μm. (C) Inter-kinetochore distance was measured in metaphase cells of control (GM00323, GM01864) and Rothmund–Thomson syndrome patient (AG05013, AG18371) fibroblasts based on CREST signals for the kinetochore pairs attached to microtubules (identified by the absence of the BubR1 signal) after 3D reconstruction. (n) indicates the number of kinetochore pairs measured per fibroblast line. P < 0.001 (t test, two-tailed). The NLS region of RECQL4 binds to microtubules. (A) Xenopus RECQL4 domain structures, and recombinant fragments expressed and purified. The proteins labeled in red bound strongly to microtubules (MTs), as shown in (B) and (C). (B) The N-terminal (aa 1–594) and C-terminal (aa 607–1,504) fragments of Xenopus RECQL4 were incubated in the absence or presence of MTs. After centrifugation, the supernatant (s) and pellet (p) were analyzed by Coomassie staining or Western blot (WB) against His6-tag. The respective fragments are indicated by arrows. (C) Different RECQL4 fragments in the N-terminal part of the protein were analyzed for MT interaction as in a (B). (D) Sperm chromatin was incubated with interphase RECQL4-depleted extract supplemented with mRNA encoding wild-type REQL4 or the deletion mutant (Δ546–594). Chromatin was re-isolated by centrifugation and analyzed by immunoblotting (lower panel). To check for efficient translation of the added mRNA, control (mock), RECQL4-depleted (ΔRECQL4) extracts, and RECQL4-depleted supplemented with mRNAs are analyzed in the top panel. Figure 7. The microtubule-binding region of RECQL4 is required for chromosome alignment. (A) Schematic representation of Xenopus RECQL4 and constructs used in add-back reactions. The position of the N-terminal Sld2-like domain, involved in DNA replication, the NLS, and the helicase domain are indicated. The Δ546–594 mutant lacks the NLS region. The K758M point mutant is a known helicase-defective RECQL4 version (Rossi et al, 2010). (B) RECQL4-depleted (ΔRECQL4) CSF extract was incubated with wild-type or Δ546–594 mRNAs for 90 min. Expression of the recombinant proteins were confirmed by Western blotting using Xenopus antibodies. The resulting extracts were used for microtubule (MT) binding assay. (C) Sperm was incubated in control (mock) or RECQL4-depleted (ΔRECQL4) CSF extracts supplemented with the indicated mRNAs for cycled spindle assembly in the presence of Alexa 488-labled tubulin. At the end of the reaction, samples were fixed and stained with DAPI for microscopy. Chromosome alignment was quantified analyzing all bipolar spindle structures identified. Columns show the average of three independent experiments and circles indicate individual data points. Scale bar, 20 μm. (D) Cycled spindles assembled as in (C) but with the helicase-defective K758M mutant. Depletion and add-back efficiency was analyzed at the end of the assay by Western blotting. Chromosome alignment was quantified. Columns show the average of two independent experiments and circles indicate individual data points. (E) Cycled spindles assembled as in (C) but supplemented with mRNA encoding for wild-type or different C-terminal RECQL4 truncations. Depletion and add-back efficiency was analyzed at the end of the assay by Western blotting. Chromosome alignment was also quantified. Columns show the average of at least two independent experiments and circles indicate individual data points.